Happy and Peaceful Holidays to Everyone! 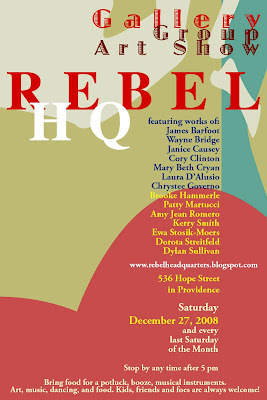 Hope you can join us for the special End of the Year Rebel HQ Gallery Group Art Exhibit on Saturday, December 27, 2008, starting at 5 pm. We will be hosting a group show of fourteen artists featured in the invitation above. If you wish please bring an item that represents something you want to let go of in the new year, so you can toss it into the fire. Eric Klein will be assisting anyone interested in a ritual of Letting Go. Bring your Intentions, Inspirations, Good Wishes and Voo Doos! As always Wayne Bridge and Dorota Streitfeld are the accompanying host artists; and Richard Streitfeld is our host of honor and whimsy, bank of information and network advice. All art is offered for sale, discussion, comments and ice breaking. Bring pot luck food/drink, franks and wursts, kelbasas and sticks for the outdoor fire pit, marshmallow, hot chocolate; and musical instruments, if you play. This entry was posted in Uncategorized on December 7, 2008 by dorota.